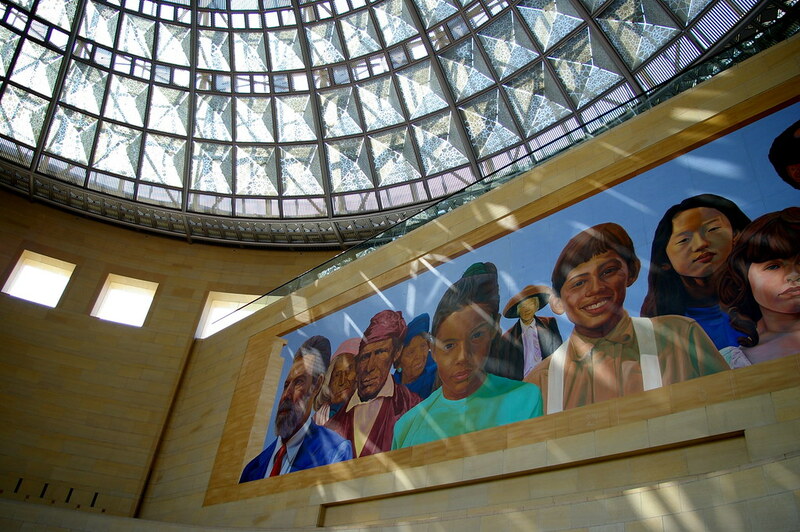 Eager to learn more about this mural in Union Station? Observant readers will have noticed a couple of new items included on today’s Go Metro Weekends roundup: Metro Art Tours. These free tours, put on by the Metro Art Docent Council, celebrated their 10th anniversary last year. Metro says that over 25,000 visitors and Angelenos have gone on the art tours in the last decade, but I’m willing to bet most Angelenos aren’t even aware they exist. The tours have historically been given on the first Saturday and Sunday of each month, but for 2010 Metro has added a new weekday evening tour on the first Thursday of each month. The 20 volunteer members of the Metro Art Docent Council are well versed in the various art works along the Metro system and offer insight on the pieces and the artists who created them. And, as mentioned before, all of these tours are completely free. 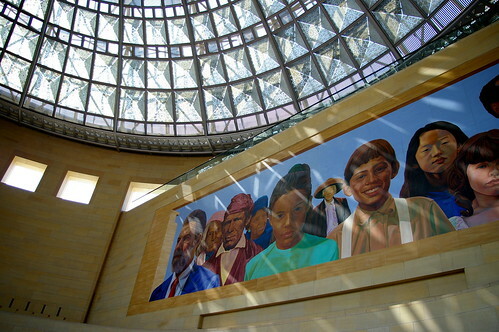 Metro invests one half of one percent of rail construction costs into original artwork along the system and the result has been a dramatic increase in public art, accessible by all, in Los Angeles. In my opinion, the synergy between art and infrastructure helps create a sense of place and defines a city in the minds of its residents and visitors, in effect creating a living museum out of the otherwise mundane. Meet promptly at 10 am at the street level entrance to the Hollywood/Highland Metro Rail Station on Hollywood Blvd. near the corner with Highland Ave. If driving to Hollywood/Highland station, park at the Visitors’ Center at the Hollywood/Highland shopping center complex to obtain partial parking validation. Meet promptly at 10 am at the information booth inside the entrance to historic Union Station at 900 Alameda St. in Downtown Los Angeles. There is pay parking at Union Station and metered street parking, and pay lots in the immediate area. And remember, if you can’t make it this weekend, tours are given every month.